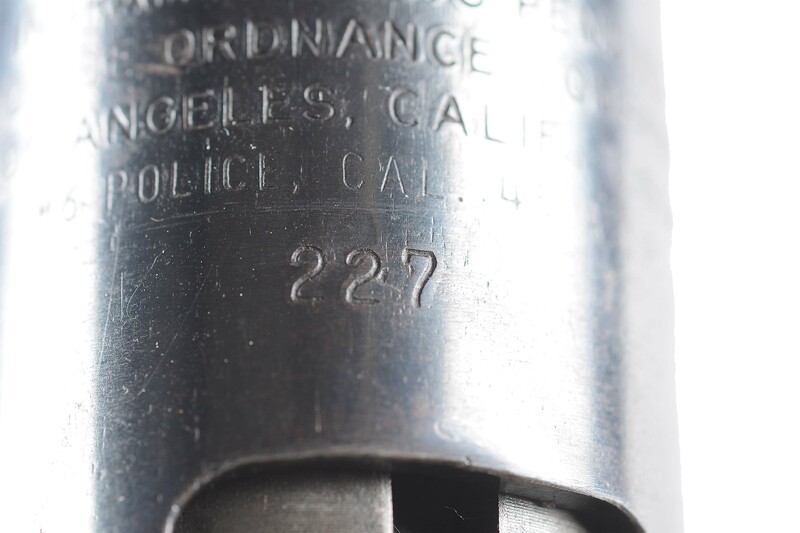 Lot Detail - (N) Police Ordnance Co. Model 6 Machine Gun (CURIO & RELIC). (N) Police Ordnance Co. Model 6 Machine Gun (CURIO & RELIC). Extremely fie Police Ordnance Co. Model 6 machine gun bears more than a passing resemblance to the iconic Thompson machine gun. One might say a far less expensive copy. 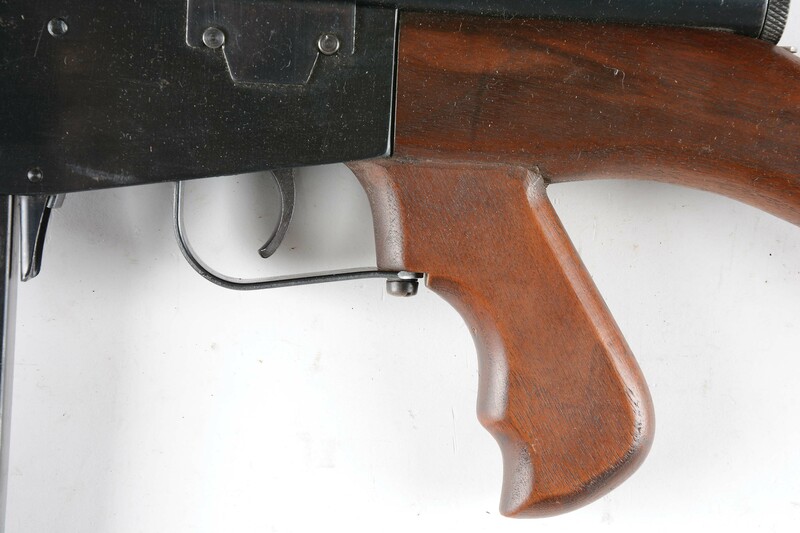 This is an extremely early specimen with a three-digit serial number and "KING" patent rear sight, very reminiscent of those seen on Winchester rifles. Bolt and mainspring retain by a screw-in cap at the rear of receiver with a push button release. One 30 round magazine is included. High quality wooden furnishings with sling swivels that complete the profile of this machine gun intended for sale to police departments. Overall in appearance, extremely fine original lustrous blue finish. Barrel has plier jaw marks at outer edge where at one time the barrel had been apparently removed. Bore is near excellent, shiny and bright. Bolt face is extremely fine. Wood is extremely fine with some occasional light handling marks. An attractive machine gun and an early manufactured specimen of this model. 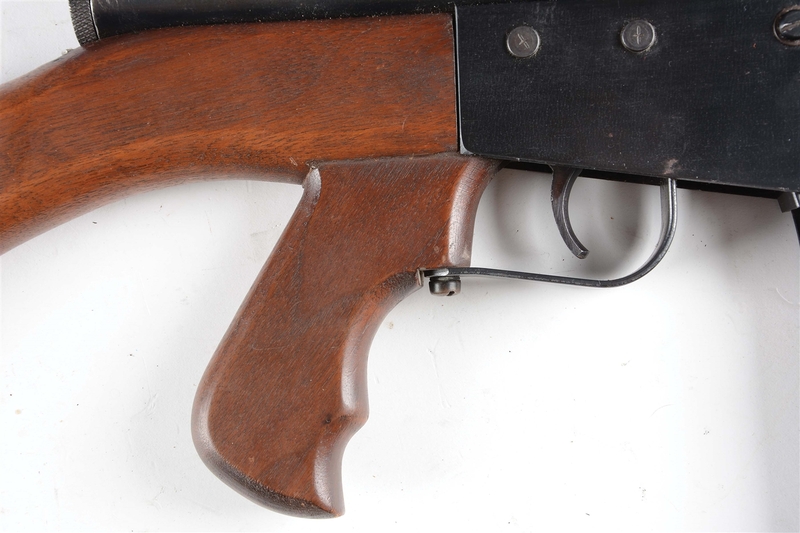 THIS IS A NATIONAL FIREARMS ACT ITEM AND REQUIRES BATF APPROVAL PRIOR TO TRANSFER. THIS ITEM IS FULLY TRANSFERABLE ON AN ATF FORM 3 OR 4 AS CURIO & RELIC ELIGIBLE. Auction closed on Friday, November 2, 2018.